Ashby's Mill, often referred to as simply Brixton Windmill, is a restored grade II* listed tower mill at Brixton in the London Borough of Lambeth. The mill was in Surrey when built and has been preserved. Ashby's Mill was built in 1816 and worked by wind until 1862, when the business was transferred to a watermill at Mitcham on the River Wandle. The sails were removed in 1864 and the windmill was relegated to use as a store. In 1902, the lease on the watermill expired and a steam engine was installed in the windmill. This was later replaced by a gas engine. 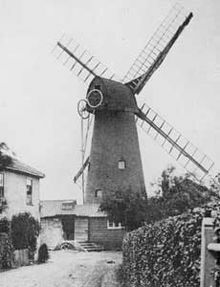 The windmill was worked by engine until 1934, and supplied wholemeal flour to West End hotels and restaurants. After the war, there were proposals to demolish the mill and build a block of flats. The proposal was rejected and it was decided to conserve the mill, which was restored in 1964 by London County Council. New sails were fitted, and machinery from a derelict windmill at Burgh le Marsh, Lincolnshire installed to replace that which had been removed. The work being done by Thompson's, the Alford millwrights. Following restoration, the mill was opened to the public at Easter 1968. The mill passed to Lambeth Council in 1971 and remains in their ownership. Further restoration was carried out in 1978 and 1983, but the windmill had been placed on the Buildings at Risk Register in 1995. The Friends of Windmill Gardens had been formed in April 2003 with the aim of restoring the windmill and surrounding area as a public amenity. In September 2004, an archaeological dig was organised, with assistance from the Museum of London Archaeology Service. A£25,000 grant was given by Lambeth Borough Council towards repairs to the mill and gardens. A£2,000,000 restoration plan has been put together with assistance from the Horniman Museum and the Society for the Protection of Ancient Buildings. An application for a grant from the Heritage Lottery Fund was submitted. The Heritage Lottery Fund granted £397,700 towards the restoration. Lambeth Council and the Friends of Windmill Gardens also contributed towards the restoration of the mill, which cost £581,000. The restored mill was officially opened to the public on 2 May 2011 by Chuka Umunna, MP for Streatham. For an explanation of the various pieces of machinery, see Mill machinery. Ashby's Mill is a four-storey brick tower mill with a boat shaped cap. It had two Patent sails and two Common sails. The cap was winded by a hand wheel, no fantail being fitted. The cast iron windshaft is the only remaining original piece of machinery. The mill is 22 feet (6.71 m) diameter at the base and 39 feet 6 inches (12.04 m) to the curb, and 49 feet (14.94 m) high overall. Windmill World webpage on Ashby's mill. Wikimedia Commons has media related to Ashby's Mill, Brixton. ^ a b c "History". Friends of Windmill Gardens. Retrieved 18 May 2008. ^ a b "History, p3". Friends of Windmill Gardens. Retrieved 18 May 2008. ^ "OLD MILL IN YARD AT NUMBER 51, BLENHEIM GARDENS SW2 (south off), BRIXTON, LAMBETH, GREATER LONDON". English Heritage. Retrieved 18 May 2008. ^ a b c d e f Farries, Kenneth G & Mason, Martin T (1966). The Windmills of Surrey and Inner London. London: Charles Skilton. pp. 58–59. ^ a b c d "History, p2". Friends of Windmill Gardens. Retrieved 18 May 2008. ^ a b c "History, p5". Friends of Windmill Gardens. Retrieved 18 May 2008. ^ "History, p4". Friends of Windmill Gardens. Retrieved 18 May 2008. ^ "Then and Now: Brixton Windmill". Urban 75. Archived from the original on 6 June 2008. Retrieved 18 May 2008. ^ "Friends". Friends of Windmill Gardens. Retrieved 18 May 2008. ^ "Windmill dig unearths history". BBC News. 18 September 2004. Retrieved 18 May 2008. ^ "Lambeth Council grants £25,000 to Brixton windmill". Windmill World. Archived from the original on 18 May 2008. Retrieved 18 May 2008. ^ "£2M project launched to restore Brixton windmill". Windmill World. Archived from the original on 16 May 2008. Retrieved 18 May 2008. ^ "Brixton Windmill reopens after restoration". BBC News. 2 May 2011. Archived from the original on 2 May 2011. Retrieved 3 May 2011.